Over the weekend, our UMass Hotel was filled to capacity. Our catering department prepared everything from a mega lunch event for 1000 people to a red-carpet, black-tie dinner. And all the while we were still serving 40,000 meals daily to our student/staff customers in our dining commons and retail locations. The events went well; we all heard praise about the quality and service we provided thanks to the efforts of our 750 dedicated employees and 1,500-student staff. It comes down to this: We provide a core service to this great university, and we love what we do. On our campus, food matters. 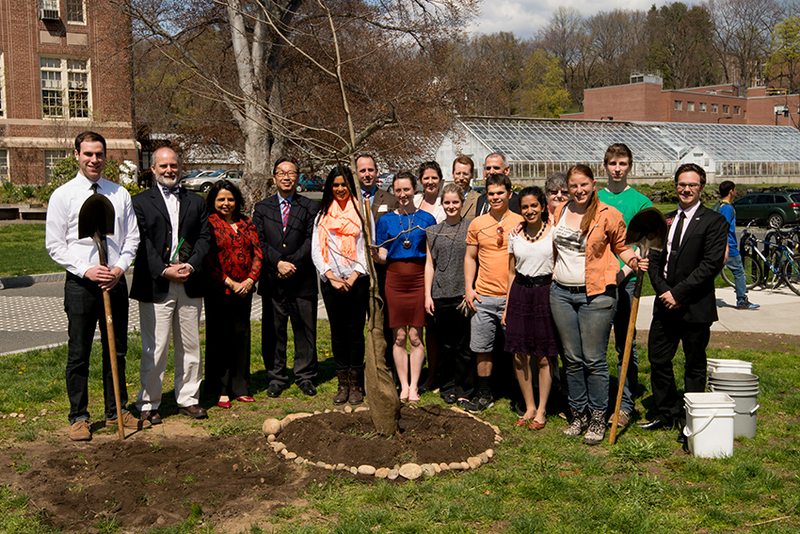 The National Association of College & University Food Services (NACUFS) awarded us with the their first-ever sustainability awards, so we had a tree-planting ceremony at the permaculture garden at Franklin DC to celebrate We were honored to have Mala Subbaswamy, our chancellor’s wife, and Matt Biette of Middlebury College’s dining services, join us for the event. It was a great feeling to look back at the evolution of our ecological garden, which has produced more than 2000 pounds of food. It literally transformed what was once just a lawn into an integral part of our campus. And it all came together through the work of more than 1,000 volunteers and students. What a great way to build community. At UMass Dining, food is always the topic of conversation. Like never before, we are at the center of this incredible, interconnected food world. We’re in the business of providing delicious, healthy, and sustainable meals, serving more than 5 million meals annually. All the while, we educate our customers about culture, global cuisine and sustenance. We also provide a familiar place to build friendship and foster academic discussion during mealtimes. But the relationship that UMass students have with food goes deeper than talk. They realize that food impacts health, understand that the way food is grown directly impacts the environmental, and view food as a window to the world’s cultures. Our goal is to support a resilient and healthy food system on campus and in New England. We will continue to increase the local purchasing and are poised to join the ‘Real Food commitment’ to serve you even better. As we celebrate the past 150 years, we look forward to the next 150. This is Ken Toong, thank you for keep UMass Dining on the top.